Good Morning My Divine Friends! In life we are always going through changes and sometimes those changes can be uncomfortable, sometimes it hurts and sometimes it feels great. Life is a constant learning process, once you learn or teach all that is needed from one person they move out of your life and someone new comes into your life. 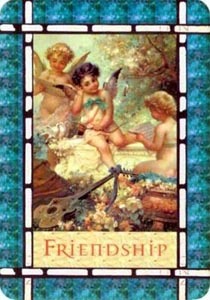 Card of the Day ~Friendship~ Changes in your friendships are occurring. Be lovingly honest with yourself and your friends right now and appreciate the healing benefits of a true friend. Not only are you changing the inside, but your life is changing on the outside as well! Among these changes are your relationships with friends. Perhaps you fear that you no longer have common interests with old friends. Or, maybe you wonder if you’ll meet new friends with whom you’ll share close bonds. Changes in friendships are natural, and the angels ask you to surrender your relationships to them. Know that God and the angels watch over you and your friends. They will lovingly help all of you during these transitions. This card also signifies that you are ready to receive new friendships with people who mirror your interests and ambitions. As you can see changes in life are necessary to continue the learning and teaching process. Be at peace in your heart and know the angels are doing everything for your highest benefit. Enjoy your day my friends. I love you all!